EL SEIBO, DOMINICAN REPUBLIC - OCTOBER 11, 2013: Honel Pierre, 56, born in Haiti, shows a journalist his work papers given to him in 1995 by the government of the Dominican Republic, when he came to work the sugar cane harvest. Pierre lives in an impoverished batey on a sugar cane plantation in El Seibo, and keeps the paper for safe keeping in his Bible. 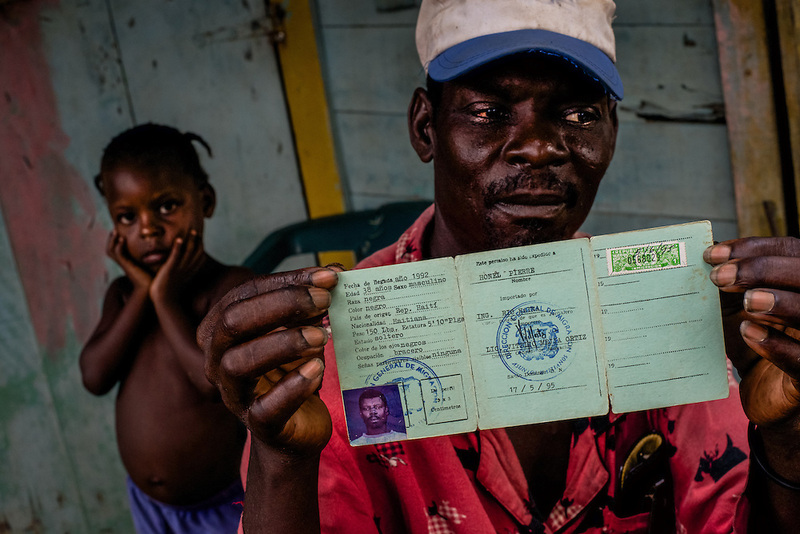 In the background is his three-year old daughter, Stella Pierre, who was born in the Dominican Republic, but denied a birth certificate. "I am ashamed," he said. "I am not always going to be here to take care of her…and without papers, she cannot leave this batey; she will never work in an office in the city without papers, so her life will be here in the batey." "Not even God himself can give her papers".